The purpose of this article is to touch upon some of the less discussed aspects of lighting in planted tanks. The purpose of this article is to touch upon some of the less discussed aspects of lighting, the spectrum, the differences between fluorescent lamps and LEDs as well as the factors possibly responsible for inducing red and orange coloration of plants. It builds upon my knowledge of photochemistry, limited knowledge of plant physiology and personal experimental experience. While I tried to make the subject as understandable as possible (although some basic knowledge is required), I exhibit tendencies to slip into scientific jargon due to my professional deformation. If that happens, please forgive me. Let me start with reminding you what color rendering index (CRI) is. Basically, CRI is a quantitative measure of how an object looks under illumination of the given light source compared to an ideal light source (black body, or daylight). The number is used by manufacturers to give you qualitative information about their LEDS with 100 being the highest possible number. In my opinion, there are several problems with CRI, especially with relation to planted tanks. While CRI gives you some information about how realistically the colors are rendered by your light source, it provides you no information on how aesthetically pleasing the rendition actually is. Another major problem is that usually CRI calculation does not include R9 test color (red) and therefore it does not tell you how accurately red color is reproduced. In other words, the light source does not have to render red at all (R9 = 0) and it can still have very high CRI. With the rapid development of LEDs in the recent years, a new movement appeared that seems to be chasing as high CRI as possible. While I admire their passion, I do not completely agree with this and let me explain why. So how much should we be concerned with CRI actually? Well, the answer really depends on your goals. If you want realistically rendered colors in your tank, look for high CRI and high R9 value. If you only care about an aesthetically good looking tank, aim for a reasonably high CRI (>80), high R9 and tune the spectrum of your light source to your preference. Look for high CRI, but do not become obsessed by it. Higher CRI does not always mean that the tank will „look better“ to you. Let me conclude this part with three of my favorite tanks (in no particular order) that have fairly low CRIs, yet they are some of the most aesthetically pleasing tanks I have seen in my life (Figure 1-3). On the other hand, there are also many high CRI tanks which look significantly worse. You can often hear people say that the classical fluorescent tubes are superior to LEDs when it comes to coloration of plants and rendering of the colors. In my opinion, this statement is true if we are talking about out-of-the box solutions and is given by richer history of the fluorescent tubes. LEDs, while still in their infancy, offer much higher degree of customizability and opportunities once you know what you are doing. Let’s first talk about how a white LED works. In principle, there is an emitter which emits blue light (usually ~450nm) upon passage of electric current. The emitter is coated with a fluorophore which partially absorbs the blue light and reemits it as light with longer wavelengths (this process is called fluorescence and in this case produces mostly green and yellow light), resulting in seemingly white light (Figure 4). As you can see, the spectrum completely lacks anything below 430 nm and only slightly tails into the red region (above ~620 nm). These two regions of visible spectrum are practically completely omitted in white LEDs. That is right, since human eye can barely see them, the manufacturers do not really care about it. In addition, there is generally a large gap in the cyan part of the spectrum (480-500 nm) due to manufacturing reasons. The lack of red part of the spectrum leads to poor rendering of red and orange colors, whereas the absence of cyan band results in poor differentiation of green shades. Hence, the two most important colors in the planted tank are rendered poorly by average CRI LED. The issue is exacerbated even further for cool white LEDs. Some manufacturers already try to alleviate this issue by including red and deep LEDs in their fixtures, but in my opinion, in insufficient quantities. 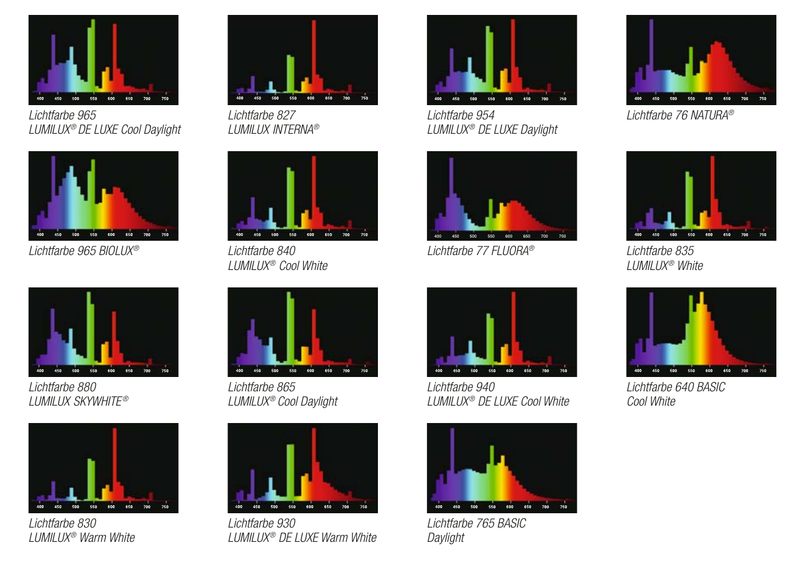 The lack of violet part of the spectrum is addressed only in some of the most recent LEDs, which are not used in the freshwater aquarium light fixtures. With few differences, the fluorescent tubes work on a similar principle as LEDs. They are low pressure mercury-vapor discharge lamps producing UV light (<400 nm) that is absorbed by the fluorophor coating on the walls of the tube and reemitting at longer wavelengths. As for the visible part of the spectrum, even the most basic fluorescent tubes possess a red band (usually at 630 nm), some form of a cyan band (~500 nm) and even considerable emission under 450 nm (Figure 5). This leads to much better color rendition out of the box. The situation is much more pronounced for the specialized fluorescent tubes for plants. The legendary Sylvania Gro-Lux, Hagen Aqua-Glo or Arcadia Plant Pro and similar tubes in general feature a band at 660 nm (deep red), 500 nm (cyan) and two bands at 430 nm (violet) and 400 nm (violet), respectively (Figure 6). Another aspect that is important in how we perceive the tank and its colors is brightness of the light. Some people (including me) prefer dimmer looking tanks and often take photographs under partially dimmed lights. This is related to the perception of brightness of colors, (over)saturation by human eye and possibly the sense of depth and mysteriousness it creates. Now, I already hear you saying „But I need a bright light for a good growth of my plants and development of good colors!“ and you are absolutely correct. What if I told you these two aspects are not mutually exclusive? The difference lies in how plants and human eye perceive light. Taking only chlorophyll A and B as the primary photosynthetic pigments into consideration, you get the notoriously known PAR spectrum (Figure 7, bottom). From this point of view, plants do not overly care about light between ~500-620 nm. However, this changes dramatically when we include auxilliary pigments (known as McCree curve, Figure 8). Suddenly the light between 450 and 550 nm is „the least“ useful, though only by a small margin now (cca 25%). In summary, when it comes to photosynthesis plants do not really care about the wavelength that much. Human eye, on the other hand, is almost completely blind below 450 nm and above 660 nm, with the sensitivity peaking at about 560 nm (green light, Figure 9). Therefore, using the light in the violet region (400-450 nm) and near-infrared region (650-700 nm) you can achieve very high intensity of the photosynthetically usable light while keeping the perceived brightness of the tank low. Varying the ratio of light in this (for us) invisible regions versus the light in the 450-650 nm region, you can achieve different levels of perceived brightness. Due to this, it is not a good idea to rely on your eyes when gauging how much light you have in a tank. For instance, see Figure 3 in which the tank boasts around 100-120 PAR at the substrate, while not being overly bright. Now, at this point, I must say it is not always that easy in real life. Other factors such as scattering of the light come into play (more pronounced as the turbidity of water increases) or transparency of the water. For instance, in case of yellowish water (e.g. due to the presence of the tannins), the result would be the opposite since the majority of blue/violet light would be absorbed by the yellow pigments (yellow color = blue part of the spectrum is adsorbed) while the red part of the spectrum would remain untouched. While most of the people seem to have grasped the importance of the red part of the spectrum, incorporating it in their DIY LED fixtures, the same cannot be said for the violet region. Very few people seem to appreciate the benefits offered by the light at 400-430 nm – high PAR, high depth penetration, low perceived brightness and the ability to „pop the colors“ (this is due to fluorescence of some of the pigments when excited with high energy light). Unfortunately, it is rather rare to see their inclusion in LED fixtures outside of the reef community. The missing piece of mosaic? Remember when I told you that fluorescent lamps produce UV light and LEDs produce blue light as the primary source of light? What I did not tell you is that the absorption of the UV light is not perfect and few percent of the UV light (especially around 365 nm and 400 nm, e.g. Figure 11) passes through. The amount of UV light emitted increases as the tube ages and the fluorophore partially degrades. This is where it gets interesting in my opinion. The UV-A light (320-400 nm) is what triggers the production of melanin pigment (sun tanning) in the human skin to prevent UV-B (280-320 nm) from being absorbed by DNA and causing DNA damage. Besides the possible DNA damage, there is one more reason why plants would want to protect themselves from high intensities of light. Upon exposure to light, the main photosynthetic pigment chlorophyll can be destroyed either directly by the exposure to UV light, or via oxidation by a reactive form of oxygen (singlet oxygen). The singlet oxygen is produced when a dye molecule that just absorbed light (excited molecule) collides with a molecule of oxygen. The production of singlet oxygen is generally more efficient as the wavelength of the light decreases. Coincidentally, carotenoids absorb light precisely in this high energy region of the spectrum (<500 nm). More importantly, both carotenoids and anthocyanines are very good antioxidants and thus extremely effective at scavenging singlet oxygen, thus possibly protecting the primary photosynthetic pigment from degradation (oxidative damage) caused by the high intensity of light. While there is a general consensus that production of anthocyanines is promoted by UV and blue light, there are also contradicting reports, suggesting it might be plant specific. The process of control is still poorly understood, however it is believed to be governed by violet light-absorbing receptors called cryptochromes. There is one thing that the reports agree on – red light does not increase production of anthocyanines. In a fact, this issue is one of the shortcomings of indoor agriculture technology that is still being elucidated in the present days. It has been observed that the content of the compounds responsible for the smell, taste or pharmaceutical activity of plants is not very high when only visible light is used. Their content, however, increases rapidly when UV-A and UV-B light is used. Among others, this is apparently very popular in the cannabis-growing community where the UV light is used to induce much higher THC content. I should start with saying that I am using heavily modded Chihiros light units, relying on LED strips (utilizing 8000K SMD 5630). The very first thing I tried was including „grow strips“ featuring 630 nm and 450 nm LED chips (5:1). The rendition of red colors naturally significantly improved. However, I have not observed improvement of anthocyanine or carotenoid production. At certain point, I was using almost exclusively these „grow strip“ and if anything, the pigmentation of plants worsened. This might be due to, in general, lower efficiency of colored LEDs. The next thing I tried was replacing some of the white light LEDs with 400 nm SMD 5050s. Despite overall lower wattage (I had to decrease the output due to algae), the color of plants improved. Note that I do not own a PAR meter, nor is any PAR meter capable of accurately measuring PAR values at such low wavelengths and therefore whether the intensity of light actually remained the same/increased/decreased is up to debate. Subjectively, due to lower efficiency of SMD 5050s and decreased wattage, I think the photon flux actually decreased. Unfortunately, being limited to LED strips, I cannot test 420 nm or 370 nm LEDs as they are not available. Currently, I am in the process of saving up for a DIY fixture based on high power LEDs where I could use any wavelength between 360 and 730 nm. Whether the UV-A light or violet light is more efficient at producing pigments in aquatic plants still remains to be seen. In the case that UV-A light proves to be beneficial, the next step will be finding the right balance, as too much will most likely lead to damage of the plants. Regardless, this part of the spectrum is severely underestimated among the plant keepers in my opinion. With the development of LEDs, we have control over the composition and intensity of the spectrum unparalleled in the history of our hobby and we should take advantage of it. Disclaimer: I do not own any of the pictures used in this article or the rights associated with them. I claim no financial interest or benefit, they are used for purely educational purpose. Burr740 and Maq are greatly acknowledged for their comments and suggestions, and proof-reading this article. Source: http://www.cree.com/led-components/media/documents/XLampXML2.pdf Copyright © 2012-2017 Cree, Inc.
 Reproduced from: https://en.wikipedia.org/wiki/Photosynthetically_active_radiation#/media/File ar_action_spectrum.gif under CC-BY license. Reproduced from https://doi.org/10.1371/journal.pone.0099010 under CC-BY license. 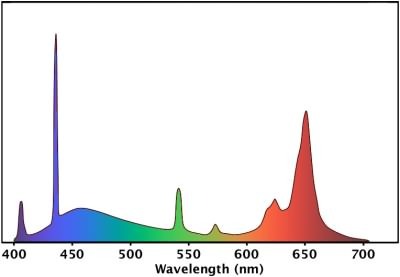 Reproduced from https://www.quora.com/Why-is-yellow-wavelength-600nm-perceived-as-lighter-than-BOTH-violet-400nm-or-red-750nm-Shouldnt-lightness-depend-on-the-wavelength under CC-BY license. Koen, a1matt, zervan and 2 others like this. What would Hemianthus Callitrichoides (HC) need to grow faster? Biology and chemistry were my favorite predates in school. I really enjoyed studying photosynthesis of plants, and how they react among themselves, the chemistry of plants is wonderful. I did research at https://vortexessay.com/, and noticed that students are ordering the most work just from biology and chemistry. I think it can be concluded that these disciplines are given to students most difficult. It is a pity, of course, because these disciplines are interesting and practical in life .. Thank you for the insight and attention to detail relating to this matter. However it has now given me a much greater sense of knowledge on the subject of light spectrums. I am still confused about the facts of what harm or effects it has with fish?? Although since i have place the UVA globes on the tank my fish have starting doing somethings that i am not sure if its related to the lights or not. but they seem to be making/reproduction activity with the Gourami fish going at it like crazy and building their nest in one corner under the floating moss. The Kribensis fish have laid eggs in the timber and breeding too. Also have a few different species of corydoras seem to be mating as well but have not seen the eggs on the glass as yet still waiting to see if this is going to happen??? Or maybe that its just what they do regardless what lights i put there.??? May I translate this article and publish in another blog ? Absolutely. As long as you mention it was written by me and include a link to this forum. I also would like to translate it and post it in a local forum. With a link to the original, of course. Thank you! It feels good to know someone found it useful. This is a very interesting article, possibly the best I have read about the importance of the spectrum of the light used for our tanks. I expect to read it several times, even using it as one of my references. I have it bookmarked. Jason King and acinonyx like this.